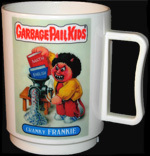 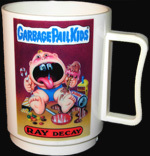 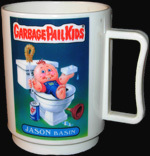 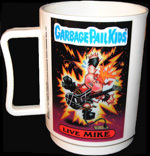 In 1986, Newark, NJ based Peter Pan Industries created a series of Garbage Pail Kids themed plastic mugs. 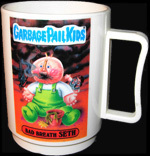 Each mug consists of 3 Garbage Pail Kids, using images from the 1985 1st or 2nd series. 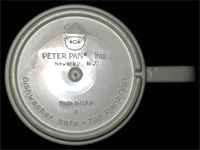 Finding 'error mugs' where the characters were printed upside down, or incorrectly is not hard to do, as Peter Pan Industries must have produced quite a few 'factory error' runs and not felt the need to destroy the errors. 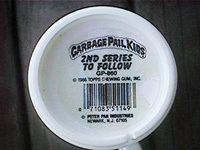 The bottom of the mugs in my collection feature the Peter Pan logo and address information, as well as handling instructions - however, images can be found of the bottom of some mugs that mention a '2nd Series to Follow'. 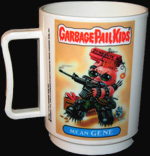 A second series was never produced, and these mugs are believed to be the only Garbage Pail Kids items ever produced by Peter Pan Industries.